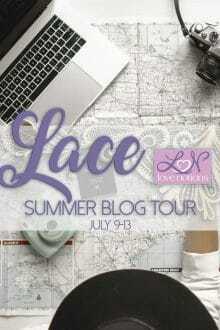 I’m so excited for you all to see the glorious creations coming your way this week on the Love Notions Lace Summer Blog Tour. So many pretty variations on your favorite Love Notions patterns! I’m a pretty casual gal and don’t usually go for a ton of lace in my wardrobe. I knew I wanted something that would get worn more than just on the rare special occasion and I kept dreaming of an easy lace woven tee. I pulled out my Harmony Top pattern and found the perfect white eyelet in my stash. And that is how my perfect summer top was born. My last Harmony top didn’t make it to the blog and I’ve been dying to make a few more for the summer. It’s just the perfect light and breezy top. I love a good woven top to dress up my usual jeans and the Harmony is relaxed and perfect for all those wovens I’ve been hoarding. I love the back shaping of this pattern. It’s a swingy loose top and bringing in the center back really helps it fit just right. I did modify the neckline this time and used the crew neckline from the Classic Tee. I love a higher neckline and with the back button it works great and still easily slips over my head. I was channeling these two Pinterest tops. They are just so classy! Using an eyelet meant I didn’t need to make any other alterations to the pattern. I actually debated between an open weave lace and worried about the seams and front darts looking strange if I didn’t finish them in the exact color serger thread. White eyelet meant no changing thread, lol! I’m so excited to have this top all summer long. It’s such a great staple and a classic I will wear for a long time to come. Are you ready for the other stops on this tour? I seriously can’t wait to check them out all week long!